There’s a lot to be thankful for this Thanksgiving – while the many retrogrades this year have brought us many a lot of challenges, they have brought us great introspection and pushed ourselves forward. 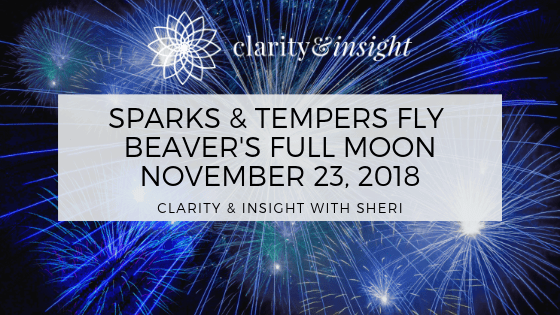 But it’s not over yet – this Full Moon is apt to serve up the family drama with a side dish of anger that could turn this year’s feast into a food fight. This month’s full moon is in Gemini thus it’s up to you to decide if your good or evil twin will win out this moon madness round. With communication skills already KO’d with Mercury in retrograde until December 6, 2018, you’ll have to work hard to rein in your anger and ego as this full moon brings in some nasty aspects that give light to your internal rage. The Moon is also opposite Mercury adding to the confusion. Facts can be misinterpreted, paperwork can be lost, and you will be feeling a bit anxious about, well, everything. The Gemini influence of this full moon also brings new information to light and we will be more vocal about what we find out. The mask slips, lies are exposed, and mysteries are uncovered in all facets of life. You may appear cold and calculating as this moon in Gemini has you accessing information in a detached manner as you quickly call foul. In addition, The Moon is opposite Jupiter making you keenly aware of meddling family members, friends, and internet trolls leaving you chomping at the bit to defend yourself. Thanksgiving is bound to be interesting for everyone! Is someone in your life jealous or controlling? Your reactions to this behavior right now will be extreme and your humor will be low as you navigate the murky waters. Watch for severe reactions to anything that calls someone out on their behavior – looks like the turkey won’t be the only thing roasted this year. Ready to book your Thanksgiving cruise yet to get away from it all? Wait – there is some good news! This crazy retrograde season is almost over and order will soon be restored. The cosmic forces promise to be a lot calmer heading into 2019. So use the tips below to keep calm and cool through the holidays. We’re almost there! Survive the emotional and angry attacks from others by listening with openness and compassion before you respond. Remember to take a deep breath and consider all that is said, otherwise you will be cleaning up more than dishes after this year’s Thanksgiving feast. Feeling your anger and ire start to rise anyway? Healthily release that anger before it gets out of control. With this full moon in chatty Gemini, you’ll have an excellent opportunity to write, communicate, or talk to a trusted friend or advisor about what’s happening before you burn bridges. Start a journal to express yourself and be open to what you uncover in this dark side of the moon. Remember that repressed anger can show up as pain on the body or “random” accidents – so use the analytical powers of Gemini and the philosophical loving Sagittarius influence to delve into what is really causing your anger. This is an excellent time really examine your subconsciousness. Clear your throat chakra (aka Vishuddha). The throat chakra is the voice of all the other the chakras. Blockages here affect all the other chakra centers and impact your ability to communicate your truth without offending people. A balanced throat chakra allows you to openly and calmly communicate even in the face of anger and hostility by other people. You can help clear the throat chakra by singing, wearing blue, practicing mindful communication and massaging your neck. However this full moon effects you, remember you are stronger than your urges. Watch your mouth, save the drama for your mama, and have a blessed holiday season! Want to know more about how this full moon will personally affect you? Order your astrological chart or schedule your personalized reading today!